Lyrics and Music Originated in Eastern Europe in the 1930s. Exact origin is hard to pinpoint. 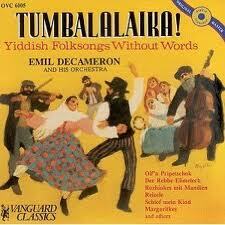 Tumbalalaika” is a riddle song seeped in ancient European tradition. The boy picks a girl to answer his riddle. "What can grow without rain? What can burn and never stop burning? What can weep and never shed a tear?" - the boy asks the girl. "Tumbalalaika" provides us with an opportunity for young people to explore the mysteries of life. This is while they get to know each other. I have spent hours and hours to pin point the origin. No luck. In the 1930s, Jewish boys, Jewish children in Volhynia, Hungary, or Romania were singing this song to their Libes ( English Sweet Heart).